The innovative project can return a former industrial waste site to productive use and help reduce dependence on foreign oil. 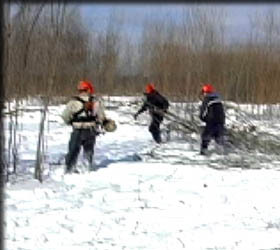 The SUNY College of Environmental Science and Forestry (ESF) has begun harvesting shrub willows from land that was once considered an industrial waste site, and within a few days, the wood will be transported to an upstate New York biomass plant for use in its electric power facility. The harvest marks a milestone in the generation of a new source of sustainable energy. “We’re using society’s castoffs, residuals such as biosolids and yard waste mulch, to improve the quality of the soil,” said Douglas J. Daley, director of the ESF-based SUNY Center for Brownfield Studies. ESF has worked at the site, known as the Solvay Settling Basins, in partnership with Honeywell International, which owns the land. The basins contain the by-product of soda ash production conducted by a previous industrial operation. The current harvest marks the first time productive willow shrubs have been grown on a site where former industrial operations resulted in soil with a high ph content, meaning it is unusually alkaline. Honeywell fertilized the site several years ago with biosolids that were the by-products of a wastewater treatment operation, said ESF’s Dr. Timothy A. Volk, who helps lead ESF’s short-rotation woody crops program. He said the fertilization enhanced the growth of the willow shrubs, which typically do not thrive in such conditions. “These beds have growth rates as high as we have on agricultural land,” Volk said. “We are producing wood chips by using waste materials. So we’ve got this cycle going where the willow shrubs are benefiting both the economy and the environment,” he said. During the next week, the shrubs will be cut, stacked, weighed, sampled for moisture and energy content, chipped and transported to the Lyonsdale Biomass Plant in Lyons Falls, N.Y., for use in its 19-megawatt electric power facility. The rapidly growing shrubs were planted in spring 2004 as part of a pilot project to develop a living cover for the Solvay Settling Basins. More than 35,000 willows have been planted. "We, at ESF, are very pleased to have the opportunity to work with Honeywell on this innovative and sustainable biomass project,” said ESF President Cornelius B. Murphy, Jr.
and turn the settling basins into an area that could produce sustainable woody biomass for the production of renewable “green” energy and biofuels in the Syracuse area. Preliminary modeling also shows that the shrub willows can substantially reduce the amount of water that percolates through the settling basin and into the groundwater and Onondaga Lake. Similar to common shrubs, cutting the shrub willows every three years is a pruning process that allows them to re-sprout with new growth in the spring. Each shrub can be harvested at least seven times before replanting. Prior to harvesting the shrubs, willow chips were tested at an independent New York State certified laboratory. There were no detections of mercury, chlorobenzenes or other hazardous compounds. Honeywell and ESF plan to plant additional willow shrubs on the Solvay Settling Basins. Lyonsdale Biomass, LLC is a biomass wood-fired energy plant. The facility receives more than 260,000 green tons (wood chips, lumber scraps, etc.) and produces electricity for delivery to the New York Independent System Operator and steam flow to Burrows Paper Corporation. The Lyonsdale facility consumes an average of 700 tons of wood chips per day for fuel. The settling basins are located in the town of Camillus, a few miles west of Syracuse. New York State Department of Environmental Conservation Region 7 Director Ken Lynch, Camillus Town Supervisor Mary Ann Coogan and Camillus town officials toured the shrub willow site with Murphy and McAuliffe to observe the harvesting process. ESF participates in a number of alternative energy initiatives. The college is involved in a project with three commercial partners to develop the first biorefinery in the United States. The plant will produce cellulosic ethanol.